The ProForm Performance 900 treadmill is part of a new Series of treadmills that offer strong motors, iFit Live technology, and a retro LED display. The multi-window red LED display has readouts for speed, time, distance, and calories burned. The 20 pre-set workouts include 10 Weight Loss programs (you select the amount of calories and time, the machine does the rest), and 10 Performance programs designed by a certified personal trainer. UPDATE: The Performance 900 treadmill is no longer available for sale. 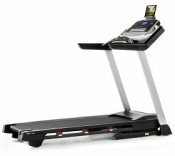 To find a comparable treadmill check out the new models from ProForm on the company site to see which machine appeals to you. 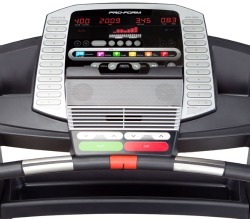 With a large 3.0 CHP motor and a top belt speed of 12 mph, the ProForm Performance 900 treadmill is a runner’s machine. 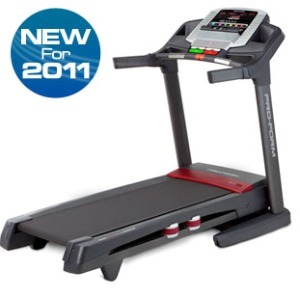 It also features advanced ProShox™ cushioning for shock absorption to relieve stress on the joints, a 15% power incline, 20" x 56" running surface, a convenient SpaceSaver® fold-up design with hydraulic lift assist, and more. ProForm has done a couple of things on the Performance Line treadmills that are noteworthy: first, they beefed up the treadmills by using stronger motors and better components under the hood. Next, they kept to the LED display on the ProForm Performance 900 console which is far easier to read than an LCD display and more durable. If you read some bad reviews on the ProForm Trailrunner Series and Power Series treadmills, it is because the touch screen LCD screens are causing all sorts of problems. With iFit® Live technology, you can access and download additional exercise programs designed by Jillian Michaels and other certified Personal Trainers. However, the iFit Live feature has a Google Maps app that requires a color LCD screen to enjoy the full benefits – it does not work with an LED display panel. When you compare the top ProForm machines side-by-side, the 900 is the Best Buy because it stays with the more reliable and less troublesome LED display. The ProForm Performance 900 treadmill is new for 2011 at $1,999 but don’t expect that price to hold up, since Proform will drop prices dramatically during sales events. If you can find it for around $1,299 it is a decent buy, but you should also review top brands at this price range including Sole, Smooth and Yowza.